This post is part of a series. Click here to read the previous post. Click here to read the next post. 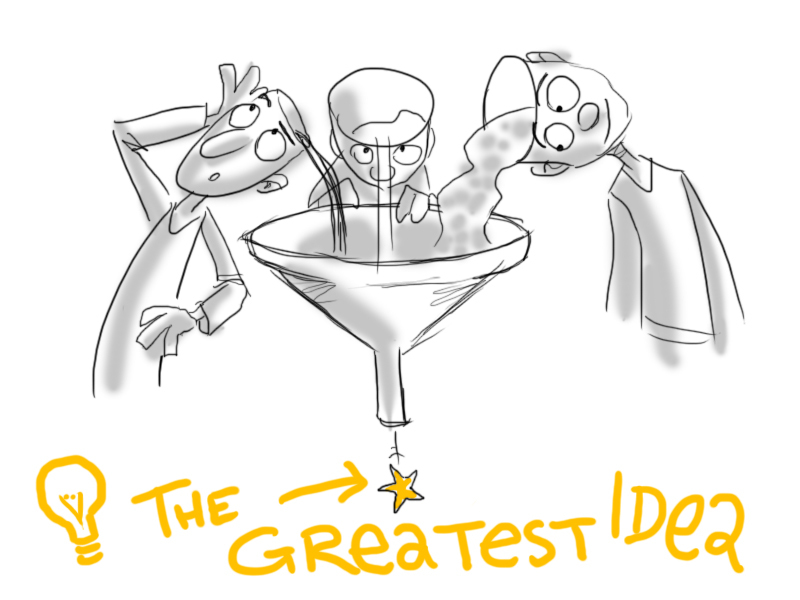 Most people’s idea of starting a new business revolves around an invention. A better mouse trap. The elusive canned bread. Something no one else has ever come up with before. An idea so revolutionary, they can’t ever discuss it with anyone and must apply for a patent immediately before the first prototype is ready. That, however, is the old way of launching a business. We know that it is very likely for new businesses to fail. The statistics are somewhere around 8-9 out of 10 that are slated to fail within their first 10 years. We also know that good ideas don’t come by easily too often and often the seemingly good idea an entrepreneur comes up with is in an industry where he or she has absolutely no experience in. This is very much like putting the cart before the horse. 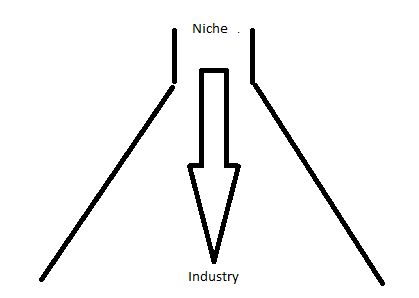 You are focusing on a niche and then considering the market/industry afterwards. A visual representation of this is like that of an upside down funnel. The downside of coming up with a new business idea this way is that it is counter-intuitive and can easily make the entrepreneur miss an opportunity to evaluate other niches he or she may be more adept in. Thankfully there is a better way to come up with startup ideas. Just turn the funnel upside down! With this methodology of brainstorming for a startup idea, the entrepreneur begins by choosing the industry he or she already possesses work experience in. 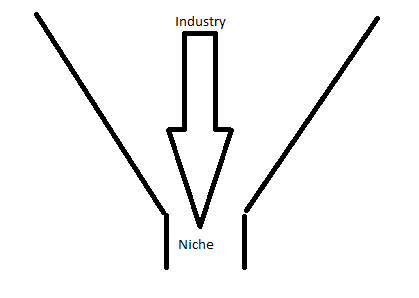 After deciding on the industry, the next step is to drill down further into the larger markets and then finally identifying a niche that is under-served and has a potential for growing and sustaining growth. Here’s a quick example of how it works and how powerful this methodology is. Utilizing information from S&P’s NetAdvantage Industry reports, an entrepreneur can quickly compile data on various industries, their recent performance, factors affecting growth now and in the future, as well as come up with a likely outlook scenario based on historical data. Banking Trailing four-quarter profits for the US banking industry through the third quarter were $153.1 billion, up a robust 15.9%. Regional banks are performing strongly, as loans grow and interest rates rise. Pockets of strength have emerged, such as auto lending, a highly profitable business for banks. (see Exhibit 1) -US ECONOMY GROWTH RATE -HOUSING MARKET ACTIVITY -NET INTEREST INCOME GROWTH RATE -FINANCIAL REGULATORY REFORMS: THE DODD-FRANK ACT, THE VOCLKER RULE The next 12 months for these banks will likely depend on the growth of the US economy, housing prices, the length of the low interest rate environment, and regulatory costs. Computers: Software SaaS revenues grew from $29 to $36 million from 2012 to 2013. However many software companies see about one-third of revenues coming from each of the three regions (the US, Europe, and Asia). Accordingly, software companies tend to be exposed to global economic trends and, overall, the US met expectations, Europe was a bit weaker than expected, and Asia was mixed, with results varying by country. (see Exhibit 2) -SaaS BUSINESS MODEL -DEVICE PROLIFIRATION OF SOFTWARES INTO EVERYDAY HOUSEHOLD APPLIANCES. -BIG DATA -CYBER SECURITY -MERGERS & ACQUISITIONS OF IT COMPANIES Overall as an industry, S&P believes that the companies are right-sized due to the M&A’s that occurred during the recession and are prepared to make the most of any upturn in end markets. Healthcare: Facilities In 2011, the S&P Health Care Facilities subindex declined 20.8%, versus a 0.3% drop for the S&P 1500 Super Composite Stock Index. However, in 2012, the subindex advanced 29.1%, versus 13.7% for the S&P 1500. Year to date through December 6, 2013, the subindex was up 46.8%, compared with the 27.1% increase in the S&P 1500. (see Exhibit 3) -RISING HEALTHCARE COSTS -2% MEDICARE RATE CUT DUE TO SEQUESTRATION -OPERATIONAL VOLUMES (SO FAR REMAIN WEAK) -LONG-TERM REIMBURSEMENT OUTLOOK REMAINS TENUOUS -PENALTIES TAKE EFFECT FOR HOSPITALS NOT LOWERING READMISSION RATES -UNCERTAINTIES DRIVING MERGERS & ACQUISITIONS Rates paid by managed care organizations (MCOs) to hospitals will remain steady, rising in the mid-single-digit range for both 2013 and 2014. This would be generally in line with the increases experienced over the past several years. Retailing: Specialty Those fortunate enough to have jobs continue to spend at a modest pace. To maintain their current standard of living, consumers have also dipped into their savings and increased the borrowing on their credit cards. While we don’t think this behavior is sustainable over the long term, total retail sales (in nominal terms) increased 5.0% in 2012. While this is a solid number, it is also the lowest rate of growth since 2009 (by comparison, retail sales grew 8.0% in 2011). We expect sales to decelerate further in 2013, given the additional pressure placed on consumers with higher taxes and anemic wage growth. (see Exhibit 4) -UNEMPLOYMENT -RECENT PAYROLL TAX LEGISLATIONS -STOCK MARKET GAINS -FALLING U.S. SAVINGS RATE -HOME IMPROVEMENT AND HOME FURNISHING RETAILERS CONTINUE THEIR RECOVERY -CONSUMER ELECTRONICS FIRMS SQUEEZED BY PRICE COMPETITION Home-Improvement and Pet-Supply stores will continue to gain momentum and increse their revenues while office supplies and consumer electronics retailers’ future is predicted to be rather bearish according S&P. Now that you know how to use the funnel method, it is time to start talking about a business plan. Read more about it here. Questions and comments are welcomed as always.